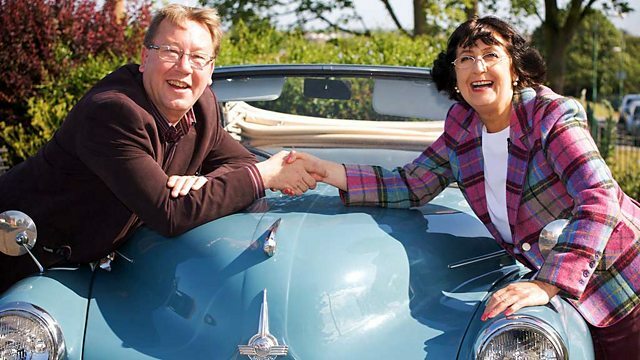 Antiques experts Philip Serrell and Charles Hanson begin the final day of their road trip in Buckinghamshire, before taking a trip around the Midlands and heading to Cirencester. ..with Charles Hanson and Philip Serrell. -I'm a bit wet sometimes, aren't I? ..and some say he has an affinity with dumb creatures. ..but it's a little dear. Our Charles from Derbyshire is equally intuitive. They say he can actually talk to antiques. Charles certainly acquired a fan club last time. I think I'm just going to pack my car and go, Charlie. and made over £900 profit at the auction. They're selling at £480 for the fans. F-A-N-S, what does it spell? Ah, it's like a recurring nightmare, Charlie. he's managed to increase it to a respectable £357.50. Shall I lend you a fiver? Cirencester in the county of Gloucestershire. southwest for the deciding auction at Cirencester. That was earlier in the trip, Charles. The town's quite a transport hub too. and then there's the Grand Union Canal which also passes through. -And there is my shop. I'm going to get him! Hold up! and reproduction with the occasional antique just waiting to be spotted. If that is rococo, it's worth maybe £300 or £400. It's priced at 65. I have a feeling it's probably a reproduction. but there's enough of a mix here to get him excited. METAL CLATTERS Sorry about that! I suggest you move to another part of the shop, Charles, smartish! That's nice. This is good. Oh, that's nice. That's pretty. Look at that. Oops. Up she goes. it ought to be a log bin or a coal box. and it's priced at £98. It's lovely. I'm quite tempted with this, so I'll give it some thought. Phil's heading west. Quite appropriate, really! and the ancestral home of George Washington. -Simon, Philip, how are you? -Philip, welcome to Sulgrave Manor. Yeah, it's lovely. This is a house and a half, isn't it? of the first president of the USA. So, this is 1550 and George Washington is when? Well, there's all sorts going on here, isn't it? -..and then we've got the stars and stripes. -Three stars and two stripes! -Indeed, yes, on the front of the house. to the family at the Battle of Crecy in 1346. Is that where the stars and stripes comes from? -Well...many people say it is. -you should base the flag on his coat of arms." the first president, it really is a must-see. but, in the great hall, they even have it in writing. the president of the United States would now be living in Hertburn DC. and subsequently, a captain of the local armed militia. began in 1775, Washington was appointed commander in chief. This is an original Gilbert Stuart, but it's not THE original. produced a very famous portrait called the Athenaeum portrait. "I rather like that. Will you do one for me?" And Stuart said, "Give me 100 and I'll do it." -And, reportedly, Stuart did this about 130 times. be reproduced about a squillion more times and counting. -It's on the dollar bill. And this is supposedly one of the great mistakes of history. and the printers had to re-reverse it to get it the right way round. the portrait of George Washington. -..it's the other way around. -And he's still there now. -And he's still there now to this very day. -Tell me, does your canteen accept these? -Uh, we will from you, Phil. Come on, let's go for a cup of tea. Now, talking of hard cash, any news on Charles' first shop? How did you get on this morning, Charlie? Did you spend some money? which should add a little spice to your trip to Brackley. Mercedes Formula 1 Grand Prix team and some fine Georgian architecture. The Antique Cellar is huge. get our two revved up and off the grid. These are nice... No, not really! with his comfortable lead, Charles can dilly-dally as much as he likes. The pressure is very much on Phil. -Hi, Penny, you've got the key. Brilliant. -what would you like to look at? -I like a knight in shining armour. -There's nothing like a man in armour. Well, Phil's around somewhere, you know. Phil's around on the prowl. -Now, what age is that? -I can't imagine there's a great age to it. A novelty cigar lighter, priced £25. Yeah, it's just missing something, isn't it? What's it missing? Yeah. It is quite novel. Is there much room for manoeuvre in that price? What's your best? -Not an awful lot, I'm afraid. -Penny, whisper to me. Penny, whisper to me. -The protocol in your big emporium is 10%, isn't it? £15? No, no. Take 15? No. Because it's all about 10% in here, so you've got to be fair. Close, but no cigar, Charles. -Now, what's Phil got his eye on? -Those are quite fun, aren't they? no great age, probably 1920s. just made a little bit out of the ordinary by all this lot here. This is mahogany, his is probably stained beech or something. Well, he did buy a rudder on an earlier leg. Charlie, I do appear to be up the creek without a paddle. This might do the job, mightn't they? Look at that. We could perhaps have a go at those. they're hardly the make or break gamble he had in mind. Time to have a word with Penny. -You just need a boat now. A boat? Please don't tempt him. -Yeah, well, they're a bit of fun, aren't they? I think they're probably painted, aren't they? Ah, I think he's after a bit more than 10% by the sound of it. Phew! First buy at the very end of the day. Now, how's he going to keep those hidden? there's an awful lot of shopping to do tomorrow. -Shall we pick some blackberries? -People will talk. There's cars behind us. -Next day, things are a trifle soggy. -Charlie, why are we up the hedge? Sorry, I can't see a thing out the window. whatever reason, the sum total of their purchasing efforts yesterday. I charge like a wounded rhino in here. because, with time running out, Phil's still over £800 behind. ..Mr Waverley in TV's The Man From UNCLE. -I'm trying to help you out. With a friend like you, I don't need any help... Argh! Now, pull yourself up! What's up? THEY LAUGH Sorry! Sorry, Phil! So much for our agents being undercover. Right, you go in that way and I'll go this way. Um, why don't we think about it? Why don't I go that way? No, no, because I want to go this way. but there's plenty to choose from here at Shires Antique Centre. Let the games commence, eh? cost me £400? I can afford it! Now, we know you're very fond of those. He's got plenty! Add some on! Don't take it off! He's got thousands. If you don't ask the question, you never know. It's a wonderful thing. I can't quite afford it. If it could go maybe a bit less, I could do. A serious, serious work of art. I love it. OK, let's forget the suit of armour. Even Moneybags here can't buy that. Now, from top dollar to bargain basement. It's a pine, probably late 18th century, pine box. some quite attractive Hornby bits and pieces in here, which is quite nice. That's one way of describing them. The market is pretty buoyant for such tin plate toys from the 1940s, '50s. and this would be probably date again to the early '50s. Yeah, I just feel... What's the best price on this? Erm, we've got 10 on that. We could do that at 5. Yeah, OK, I'll have that. Thanks very much. That's my first buy. -Thanks very much, I'll take it. Right, I'll keep on going. Thanks to John, Charles has finally got started. His travelling companion's got his eye on a box too. kept in a box at the bottom of the stairs and that's it. It's called a candle box and that's just a really sweet thing. (I actually think that's probably elm. I wonder what Alison can do on it? The ticket price is £149. Wow. -That belongs to our restorer. We're selling it for him. -OK, can you hang onto that for me? has tracked down a cabinet with some very nice silver. This is a lovely, what you call a George III silver helmet-shaped cream jug. -In France or in England? George the II. -I'm very much up on my French history! -Yeah, good man, good man. but Allan does have some good things. -It is for what it is. It's a pretty silver, neoclassical style sifter. -It's a salter, I would imagine. come out, because the cleaning agent has, obviously, filled in the holes. The ticket price on the sifter is £65, but the jug's a hefty £260. What's the absolute best on that? To give me a life! -I need to eat as well. -Of course you do, absolutely. -Make it 35 and we'll do it. -Yeah, go on, I'll do it. Good man. Blimey, that's a big discount. -It's 18th century. How often can you buy a bit of 18th century silver? -And what other piece of 18th century have you found...? I'll tell you what, call it 100 for the two. -So, that will be 40 and that will be 60. -I'll take it. Thanks, mate. -You've got to do it. Well done. I think he's mad about that bargain bit of Georgian. -Who was king of England? -No, it was George the III! Go on. Let's take you through it. Who was king of England? -Good lad. Put it there. That's a deal. And they said HE was a bit eccentric! Ah! Phil's got his eye on some of his beloved Worcester. Richard Sebright, and that plate was painted by Richard Sebright. The ticket price is £190. 1921, 1922, 1923, 1924, 1925. So, is that what the ticket says? -I should have read that in the first place. Not so much fun though. ..there and there. Now, that was to be 120 to 180 quid. How are we fixed on that one? If I bought the two, do you think you could do me a deal? This and the candle box. Could you really help me out? £240 would be the best on the two. albeit for a nice couple of things. Can I give you £200 for the two? Can we split the two down the middle? Can we go 220 for the two? And then I'll definitely have them both. What am I doing here? What am I doing? Gambling, Phil. You'll need to, if you want to catch him. I really can't, I'm sorry. -Put them by for me, I'll be back in a minute. Time for Alison to call the dealer. Now, what's Charles getting excited about? It's a very sweet dog. Isn't that nice? What's the best price on that? Could it be like...? Could it be like £15, do you think? -probably go to 25 on that, at the best. has its gold stopper, it's called The Spaniel. Um, and it's just quite a nice object. Do you think she'd go 20 for it? -Is it worth a call? -I think she'd do 20 on that. -It's a modern day collectible. Put it there and say sold for £20. I like it. but how about Phil's double deal for the candle box and the plate? All right, can we do it, my love? He appreciates that's going to affect the value of it. Yeah, yeah, yeah. That's lovely. Thank you very much indeed. Phil, having bagged that brace for £220, is off to pastures new. But Charles just can't stop buying this morning. -John, is this your squeeze-box? when it comes to restoration, there's no holes in the actual squeeze-box. There's a restored, I think, maybe hole on the corner here. play them, but, you know, I wish I could do, because it's just folk art. What's the best price on this? It's not priced, I don't think, is it? We've got 120 on it. We could do that for 90 for you. You wouldn't go a bit less, would you, at all? -I was going to offer maybe £60 cash for it. -I couldn't do 60 on it. We could go to 80, but that would be the death on it. -..but I'll leave it for the time being. Fair enough! He's already spent an awful lot, after all. pay you £75 for the squeeze-box. The man's nodding over there. That's a done deal then. Well, if the boss accords! Guys, thanks ever so much. -This looks a shop and a half! ..but, with Barry's help, I'm sure a little something can be rustled up. I mean, that's quite a nice piece. It's interesting. -you know, wastepaper basket or something. Or you could describe it as a coopered jardiniere. -And what would be the best you could do on that? Yeah, this could go down well in Cirencester, Phil. Now, what's he got there? This is great. I love this. This is a lazy Suzy. I'm not quite sure where it gets the nickname from. ..you spun it round to him like that. but they were said to be popular with car pioneer Henry Ford. but modern versions are often found at Chinese buffets. I like that. It's very simplistic. The price is £145, but Barry's come up with a third object to ponder. Does that not interest you? That's rather fun, you know. -cos it's not wool, is it? It's too small. So, you'd put your foot on there, wouldn't you? But how could somebody work it with their foot, unless it was a child? I think it's a child's spinning wheel. -so it would sit on a sideboard. -Yeah, it would dress it. -And it's a very interesting thing. Quite, Barry. Now, there's really no messing about with these chaps. All three items side by side and let the bargaining commence! -I've got £117 and 50p to spend, that's my budget. He took that well, I thought. The ticket price on that was 145. The ticket price on that is 85 and the ticket price on that is 98. You tell me what the best price is on each. -Well, I mean, that one is going to be £90. -Those, I would do you 100 for the two, if it helps. For the two, but that is the absolute bottom on them. -I'm going to just shake you by the hand. Yeah, that's wizard. I love those two. So, with the spinning wheel and the wooden bucket, Phil's done. Now, then, let's see what Charles has been up to. to hear the naked truth about one of its famous ancestors. -Oh, I thought you were Lady Godiva! -but I can tell you about her. -And I'm Charles Hanson, good to see you. -Nice to see you. Let's go. Earl of Mercia, and his famous wife, Godiva. ..who floats many a male boat. and believed that God wanted justice for the meek. but she asked the people of Coventry to look away out of respect. found a way of looking, um, and got caught. And so the legend of the Peeping Tom was born. a window in Holy Trinity honouring the famous protestor. Do you ever recreate the Lady Godiva scene? Is it a tradition once a year? -We have a Coventry Lady Godiva. -There's a lady who, kind of, is Lady Godiva. -Yes, is she here today? Not here today, I'm afraid, no. but Holy Trinity survived and was restored in the 17th century. medieval art, the Coventry Doom, and whitewashed it over. Thankfully, this too has now been restored. What is so doomful about that? and judges people on the choices they've made in their life. are coming, rising up from their coffins, and to be judged by Jesus. in a varnish which became so dark, it was almost hidden again. Coventry was to overcome much worse hardships in the subsequent century. -Has someone spilt a pot of ink down there? fell through into the building during the Blitz. The whole of the city centre was hit. which, sort of, so famously was completely destroyed. along with much of the city's ancient centre. We have a picture of the morning after that night. all that's left is the church. have quite a lot of human help. kept vigil, basically, night after night, in case of attack. incendiaries off the roof so they didn't take hold. for our boys to finally reveal their wares. Which is your favourite bit, Charlie? -That appears to be...what, elm? -Late 18th century. Is it a candle box, Phil? Gorgeous, gorgeous box, which, I think, will do really, really well. I'd say I love your elm candle box. I love your patination, Phil, as well. Gorgeous patination! -I think somebody's put a lot of polish into that. probably at auction between 150 and 250. What did it cost you? -Yeah, that's a really, really good buy. -what's the plate down here, Phil? ..just about the best fruit painter there was. You are the authority when it comes to Royal Worcester. -I don't know about that, Charlie. -It's got a puce mark as well. Gorgeous. -See, that could make 300 quid. -You've got some big margins here, potentially, Phil. Yeah, but those could go either way, Charles. Now your turn. -Oh, that squeeze-box looks good, Charlie. -Well, these things make money, don't they? -Um, and is that like 100, 150 quid's worth? -I hope so. It's a Lachenal. but it comes with its box. Uh, it's got a few holes in the squeezer. Oh, just details, Charlie, details. Yeah, so, £100, well, it gets you your money back, doesn't it? -Exactly, but, Phil, I've bought some history. Oh, Phil, after our road trip, I'm going back to Derby, you know? and this is Royal Crown Derby from the year 1997.
very rarely did they use a posy. and the dealer wasn't quite aware of its potential, I don't think. I can't see £1,000 in there this time. that's what it is, that's what it is. I really think Phil has saved the best till last. I love almost everything he's bought. I think his star lot must be his elm candle box circa 1760. It could do very, very well, so, who knows? He could make a £300 or £400 profit. I'm hoping I might just win this leg. He'll do very well, but he won't catch me. -Were you annoying as a child? Britannia, Cirencester, or Corinium, must have been quite something. much smaller than Londinium, but, none the less, no worse for that. -Do you know how the loser always drives? I've been your chauffeur for a week! sort of thing for so long they could have started out in an amphitheatre! make of our two chaps' lots? lots of things going for it. so, 80 to 120, where, in good condition, it could be £200 or £300. but still should be around the sort of £100, £150, around there. and he's spent just £200 on five auction lots. and he's parted with £340, also on five lots. -Oh, you're an angel, you're an angel. Catching Charles is a long shot, but can Phil do it? His paddles could get him started. -£30. 30, I'm bid on that. 5 here. At £30 a bid. At £30. 5 anywhere? Oh, five! Thank you! -35...in the room now at £40. -Well, I can't believe it. You've doubled your money, you've doubled your money. At £40, you all sure then at 40? That little profit's just a drop in the ocean. Next is Charles' George III jug. Who'll start me? Is that 50 to get on? £50. -30 to get on then. £30. Got to be 30, hasn't it? -At £20 a bid here, it's go to be cheap at £20 only. At £75 in the room now. £75, you all sure? It could have been a lot worse. That could have been...£25. Well, it looked like he was going to sell it for less than scrap. Or encouraging, Phil. A tiny profit after costs. -It's a hard game, Phil. -So you want to swap? who cares, as long as Cirencester loves it. Got to be £20. A tenner then? £30 is on my right. Selling here then on my right. You all done then at 30? How much did it make? £30? Oh, jeez. It's looking like profits will be few and far between. Hand on heart, I think it's worth nearly £100. -Now for Charles' other bit of silver. -£20, a bid here at 20. -That's good, Charlie, that's good. All done then at 50. It's a tough auction house. Yet another close one, but it's not over yet. I'm nibbling along, Phil. I'm nibbling. If Phil's fruity Worcester does well, he could be back in it. At 30, 5, anyone in the house here? At £30, 5, £35, 40 if you like now, at 45 it's in the room. -The cheapest thing I've ever seen. -At £40...5, thank you, madam. -It's moving, now it's moving. -At £50, 5 if you like. At £55, 60, at 65, 70 now then. At 65...70 on the net. -At £70, you all sure? Selling it on the net then at 70. That's just 50 quid down the drain, Charlie! Someone's got a really good thing for a really low price. Uh, like I've felt every other day on this road trip! Look at me! I love you, mate! Time for Charlie's floral pooch to have its day. -I know, it's howling for a profit. -It's cheap, isn't it, Charlie? At 30, 5 now, still cheap at £30. 5 anywhere now? -At 35, 40 if you like, sir. -Go on, sir! It's a rare thing! -It's a rare thing! One more for the road! -5 to me now at £40. At £40, a bid here, you all sure now at 40? I can't complain, at least I haven't made a loss. -Yeah, absolutely, and I have. -or finally snuff out his hopes? at £30 on my left now, £30, 5 anywhere now? at £35 it's sitting on my left then at 35. That's for nothing, isn't it? It really is for nothing. Another big loss and another big bargain for someone. -It's not quite the finale, is it, we wanted? Charles' toy box was so cheap it can't fail. 15, at 15, 18 if you like, now at 15. 18. -Look over there, Phil. Look over there. -Go on! Keep going, keep going! -At 25, 30 if you like now. -Well done. Very good, Phil. Put it there. It's all going the way of the winner in waiting. So, Phil just needs his spinning wheel to make over £1,000. -I just think that's funny. -Yeah, I've really enjoyed this. Oh, my Lord! That cannot be worth £10! Give me a hug! Give me a hug! Charlie, how is that worth a tenner? Oh, dear. At times like these, it's best to see the funny side. I had a dream just then that that made £10. What can Charles squeeze out of this one, I wonder? -130, at 130, you all sure? So you should be, Charles. I had tragedy, tragedy and tragedy! has turned into a one-horse race. Charles wins by a country mile. £188.30, leaving him with a final total of £169.20. with £1,253.84 is this week's runaway winner! Charlie, let me shake you by the hand. Phil...it's been a wonderful time! -I've really enjoyed it. Thanks. -It's a week I will never forget. we're full of national pride as Anita Manning pipes up for Scotland. And James Braxton hopes for some right royal bargains. -The Queen might be at the sale. Philip Serrell and Charles Hanson begin the final day of their road trip at Old Wolverton in Buckinghamshire, before taking a trip around the Midlands and heading to auction in Cirencester.